What can I say, I really love all the End Times models and the Putrid Blightkings have to be one of my favorite. I haven't seen many super high quality paint jobs on them yet, since most of what I've seen out there was somewhat rushed so they could sell them within a week or so of release. This guy though is awesome. It's classic Nurgle green, which some people don't like thinking it's too cartoony. For me though, it really fits. All the colors are blended as smoothly as you would expect from a display model. The hobbyist really has some fun with the angles on the armor plates too. I love the switching from super bright to really dark as it bends around one of the edges. The non-metallic metals are top notch with some good rust effects and the skin is suitably diseased looking. There isn't anything that really stands out as being uniquely different from what we might see on other Nurgle models, but what is there is just really, really well done. I'm a sucker for the asymmetrical display bases as well. It makes the plinth more part of the model then just solely a framing instrument. I'm not really sure what is supposed to be going on with those glowing blobs on the dirt. I'm assuming it's just magical slime or something, but it looks good, suits the model, and shows off some glowing techniques. I wish there was just a little more to break up the brown of the dirt, but it doesn't really hurt the model at all. It could have just added a little something extra to it. 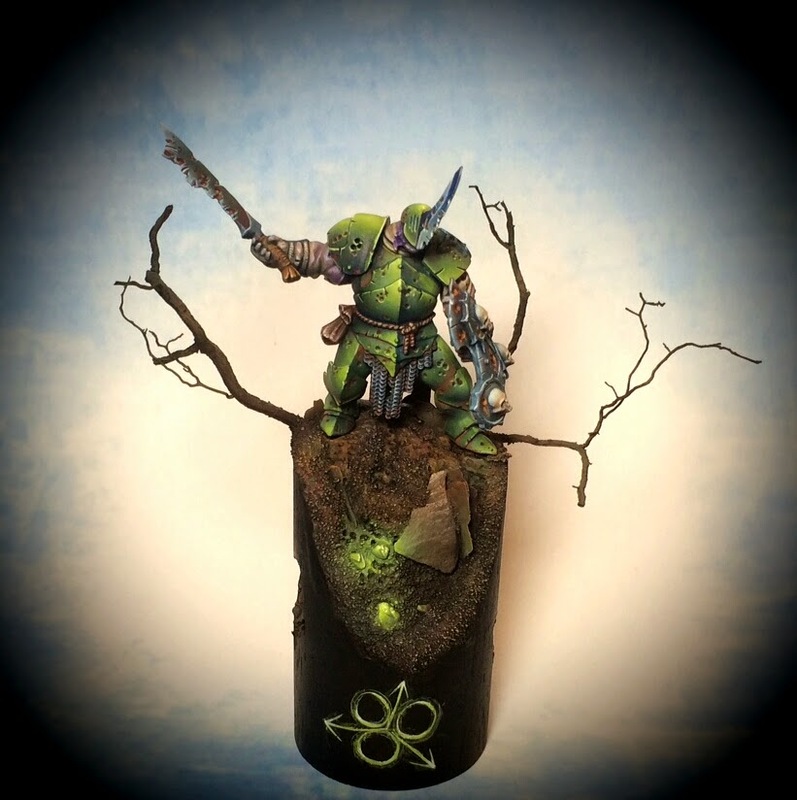 The Nurgle symbol on the front of the plinth is a nice final touch too. I'm sure Papa Nurgle would be proud. Be sure to check out more views of it on Cool Mini or Not and show the artist some love if you like it. You can also see more views of it on the artists own blog at Chestnut Ink. Don't forget that the Mengel Miniatures Painting Competition is up and running now. For full rules check out this post. The first step to entering is registering on the Forums and creating a post for your entry on the W.I.P. board. We already have a few entries in progress there, and they look pretty awesome!